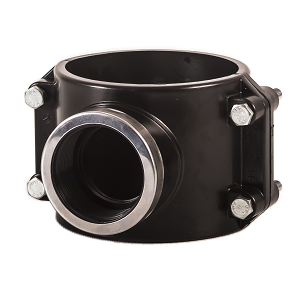 These ensure a perfect hydraulic seal in the construction of pressurized distribution systems. 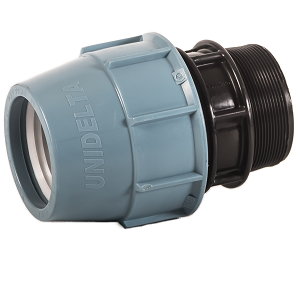 Unidelta compression fittings are designed specifically for connecting polyethylene pipes with an outside diameter from 16 to 110 mm. They are fully compatible with all PE80 and PE100 pipes complying with ISO 4427, DIN 8074. They are normally used to convey drinking water and fluids at pressures up to 16 bar for generic applications. The quality of the materials used makes these fittings resistant to etching by numerous chemical substances and to UV-rays. 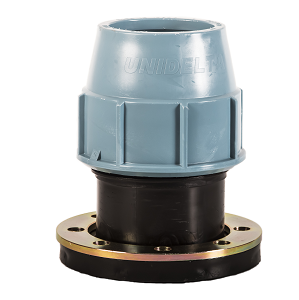 The Unidelta Universal Fitting can be used to connect systems using PE metric piping with existing pipes made of any material, with external diameters of 15-34 mm. Clamp saddles are an ideal solution for branching from existing pipelines for water and irrigation. The body of the saddle is polypropylene black co-polymer while the nuts and bolts are zinc chromed steel. Taping saddles can be installed on live water lines, reducing down time.